​ Nivedita Ranade has more than 9 years of experience in applied social science research and evaluation of programs serving children and families. She brings to JBA a strong background in qualitative research methods and child and family development in cultural contexts. Currently, Ranade works on the Design Options for Home Visiting Evaluation project, where she provides evaluation technical assistance to federal home visiting program awardees. She leads the development of in-depth case studies for the Improving Programs, Policies, and Services to Promote Healthy Development in Middle Childhood in Afterschool Settings project. Ranade also participates in research and evaluation activities for the HealthySteps Implementation and Outcome Study and the Early Education and Out-of-School Time Capital Grant Program Evaluation. Recently, she helped develop summaries of methodological approaches and research frameworks that can be applied to precision home visiting for the Home Visiting Applied Research Collaborative. 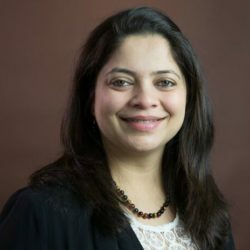 Ranade received a Ph.D. in human development and family studies from the University of Connecticut and an M.S. in human development from the University of Mumbai.